Today is, of course, Free Art Friday, but due to a special new roommate I have, I will have to post my art later tonight. Who is this roommate, you ask? Well, spinsters, prepare yourself for a shock. After a solid ten years of being a cat person, my doctor suggested I should have a puppy. So, I went to Athens to meet a little puppy named Miranda, and I just had to have her. She is so sweet and cute and frisky, and I think she is going to be an excellent new BFF...once she stops tinkling in my apartment. While I'm not really ready to forfeit my cat person card, I will make an exception for Miranda. 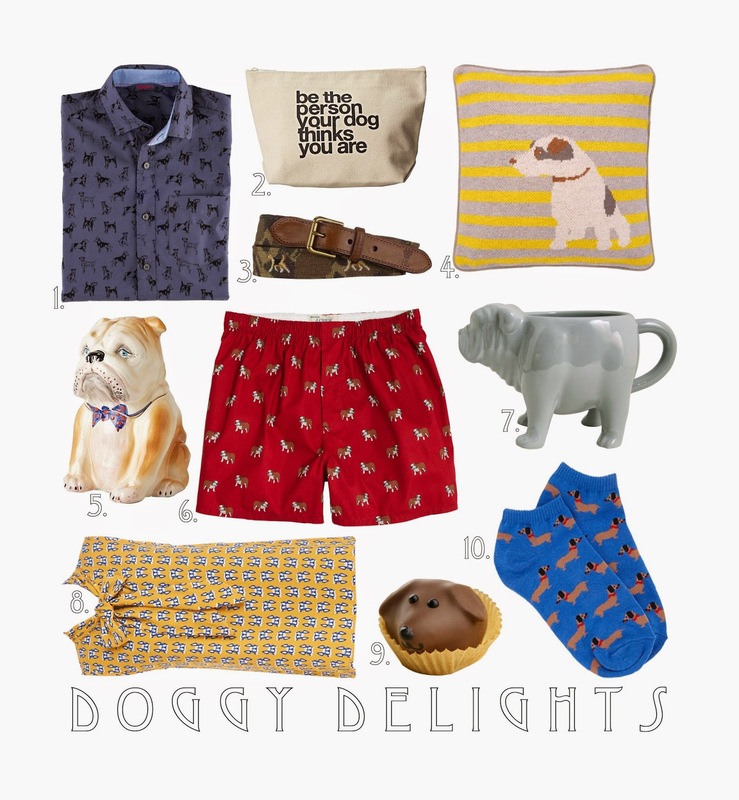 So, in honor of my new baby, I've made a gift guide for dog people. There are some items on here for men, some for women, and some for anyone who likes them. Links below! This is a cute way for the Dog Man to show his puppy love. Very cute, in fact. I'm not 100% sure what this means yet, but from how sad Miranda gets when I leave her at home, I'm fairly sure she thinks I'm a lot cooler than I really am. I've been working on the same needlepoint project since August, and I have to say that even though $71.99 may seem like a lot for a belt, for anything needlepoint, that is a serious bargain. This is a super cute cushion to jazz up your dog's favorite place to sit: wherever humans should be sitting. This design also comes in a hot water bottle cover. Keep your human treats or your dog treats in this container! Undies for men or pjs's for women. I just think this dog-shaped mug is so funny and cute. I especially like that it has little legs. This is a subtler way to show your puppy pride. At first glance, it's just a work-appropriate top. Upon closer inspection, though, it's got little dogs all over it. Peanut butter, chocolate, and puppies. Very nice. Just don't let your dog eat it. That would be bad on a few levels, one being that it's like imaginary cannibalism. I mean, you know I love socks.